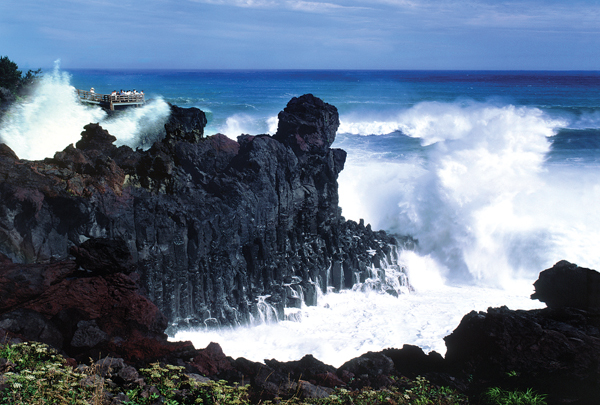 Stretched along the southern coast of Jeju island is a sight that has both tourists and Geologists excited. The Jusangjeolli Cliffs created between 250,000 and 140,000 years ago, when Hallasan was still an active volcano, offers a rare glimpse at what can only be seen at very few points around the globe. The Jusangjeolli cliffs are a foreboding sight to say the least. With almost perfect hexagonal columns, referred to by the locals as ‘Jisatgae Rocks,’ jutting 20 meters into the sky, the cliffs run for 2 km along the Daepo coast near the Jungmun tourist complex. From the observation deck above, the rock formations are countless and even though there has been much corrosion and weathering caused by the ceaseless beating of the ocean the columns stand strong and fortified. Geologists state that during the Pleistocene Period, fluid molten lava from a volcanic eruption, made its way down towards the ocean and when it hit the water the cooling lava cracked, fractured and contracted. This stress from the instant change in temperature is what caused the solidifying lava to shoot up into the air and depending on how fast the molten basalt cooled determined the future column’s height. What is so impressive about these rock formations is that they are perfectly hexagonal for the most part, almost appearing handmade. Even the most famous basaltic column structure, the ‘Giant’s Causeway’ in Northern Ireland cannot necessarily make the same claim. A park has been erected parallel to the cliffs allowing visitors to walk the 2 km distance so the pillars can be seen from as many angles as possible. In fact the path that runs through the park is a designated Olle walking trail, route 8, which would make the cliffs a perfect resting spot before continuing on with the trek. The majority of the park is rather solitary and well maintained; full of beautiful flowers, tall grass and palms trees of varying types. Occasionally, along the path there are local women selling fresh, raw fish. Near the ticket booth and the entrance to the park, there are some minor attractions, like a large conch shell that one can step inside and plastic dolphins for photo ops. There are some large rock sculptures and a sundial as well. Everything seems to be designed with a naturalistic look in mind. Unfortunately, there isn’t much information available about the Jusangjeolli Cliffs, except for a billboard that uses a very technical language to explain the formations of the basaltic columns. It’s also placed rather far away from the cliffs and may be hard to find, though there is a tourist information booth on site. Obviously, the most impressive aspect of the park is the observation deck that is multileveled allowing different vantage points of the cliff. It is quite spacious and even still, there seemed to be a constant flow of people coming and going from the deck. Though, the Jusangjeolli Cliffs may not be one of the better known attractions on Jeju they are definitely one of the more mysterious and beautiful. It may not require a whole day, or even half a day to take in the wonders of the hexagonal columns the park itself offers a rather relaxed atmosphere, which might be a nice change of pace compared to the nearby Jungmun tourist complex.